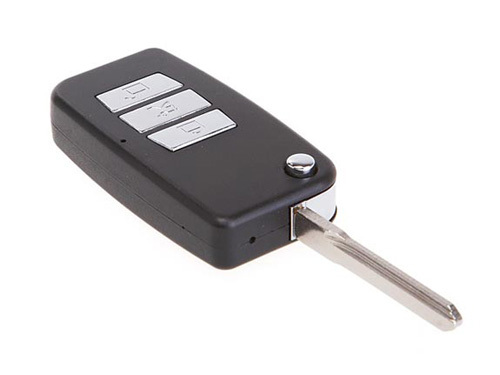 If you thought that the keychain spy camera wasn’t quite stealthy enough, this car key might work a little bit better. Just close up the key part and it would cover up all of the spots that let on that it’s actually a spy camera in disguise. Closing up the key won’t obstruct the view of the camera itself though. There’s just a small hole at the bottom of the plastic part, that no one would ever suspect is a camera. This fake key comes from Brando just like the keychain. It’s also extremely similar, the biggest difference is that they are two different shapes. This fake key has 2GB of built-in memory and can shoot at 29 FPS. The color video resolution is at 640 x 480 and then the image resolution is 1280 x 960 pixels. It has video as well as audio and a rechargeable Li-ion battery. You can purchase it for $66 from Brando, which happens to be the exact same price as the keychain. So you can pick and choose which look you like the best and not have to worry about price differences.